For that extra special event why not consider a private charter aboard our purpose built luxury 45ft day sailing catamaran. Be it a pre or post wedding celebration, a family reunion, a corporate event, a special birthday or a bachelorette party we can help you create a day that you will remember for a lifetime! We offer private charters in the morning, the afternoon and at sunset. You can choose for a 2 hour sunset sail to an 8 hour full day with full catering. Select one of our charters or contact us for a customized package to suit your group to perfection. Our catamarans are Voyage DC45s specifically designed for day sailing. This means they are open and airy with plenty of shaded areas and comfortable seating. There are two large nets out front where you can sit and enjoy the Caribbean breeze whilst sipping on a delicious rum punch, a margarita or a cool beer. There are bathroom facilities on board that are easy to access and there is a cabin where you can change. Our catamarans can accommodate up to 40 guests. However, they are equally well suited to small, intimate groups. They are well designed and easy to board so guests of all ages can join in the fun. We provide life jackets for adults, children and infants. Children love jumping off the side of the boat in the protected waters whilst we are anchored. You can catch the moments on camera yourself or we can arrange for a professional photographer to come on board to ensure that every special moment is captured. Once you decide if you would prefer a morning, afternoon, sunset or whole day simply check out the tour description for each tour. 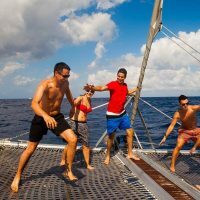 Remember these are our suggestions based on many years of sailing experience here on the Riviera Maya but if you have a different itinerary in mind we will be very happy to work with you to create the private sailing charter of your dreams. 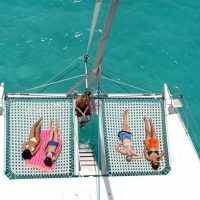 Remember if there are more than 14 guests in your group a private charter catamaran afternoon will provide greater value for money and more exclusivity. This purchase is subject to receipt of your deposit payment. Printed order confirmation, which contains the confirmation number, tour information and the date of visit. 2. Cancellations made less than 24 hours prior to a booked tour are not refundable unless a valid medical certificate is produced. For groups of 4 or more a medical certificate will only cover the person who is unwell and 1 carer unless the others in the party are younger than 16 years of age. 3. If we have to cancel the trip due to poor ocean conditions we will endeavor to reschedule your trip to a date which suits you. If we are unable to do this you will receive a full refund. 4. Whilst we make every effort possible to stick to our scheduled trips there are times when weather conditions dictate that our schedule may be altered or some activities may not be available. We do not offer refunds in this situation. 5. Please be at your pick up BEFORE your pick up time. No refunds will be given if you arrive at your pick up after the pick up time.